Karanja is also known as Karanja. Karanja (Pongamia Pinnata) formerly known as Pongamia Glabra. It is commonly found wild in the western ghats of South India, Bihar and Andhra Pradesh. Extracted Karanja Oil or Pongam Oil is a reddish-brown material with an acrid, nauseating and persistent odour and a bitter taste. By using latest technology and high grade material, we are cultivated and then present a wide array of Pongamia Pinnata Seeds. 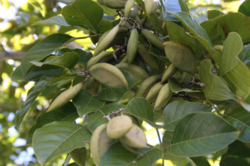 This Pongamia Pinnata Seeds is considered as alternative source for Bio-Diesel because they contain 30%-40% oil. We check them at various levels in order to ensure their purity and quality. Pongamia Oil is a good substitute of Biodiesel and can be used in Soap Manufacturing as well as Chemical Industries. 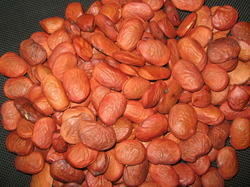 Karanja Seeds is used for exploring and oil is used for ayurvaid. Its botanical name is Pongamia pinnata. Synonym: Millettia pinnata. It belongs to Fabaceae family. We are a unique name in the market to provide our honourable customers an exclusive range of Pongamia Pinnata Seed.